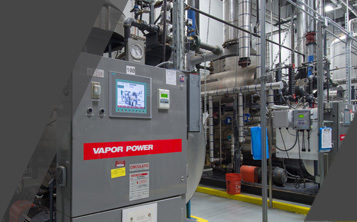 Vapor Power offers a wide range of after-market support and services for your Circulatic Steam Boiler. From the first day of operation and for the life of your boiler, Vapor stands ready to assist. As one of the industry’s leading manufacturers of boilers, packaged steam generators and thermal fluid heaters, Vapor Power International has everything you need to keep your steam boilers operating in top condition. That includes complete retrofit upgrade kits to outfit your Circulatic with the latest in controls and components. All built to the highest quality standards and codes, including ASME, FM the U.S. Coast Guard, ABS, CGA and Lloyd’s Registry. Like our boilers, our retrofit upgrade kits are developed using the most advanced production and technology to ensure the superior quality of our products. The combination of the air-cooled design with other design improvements makes this pump superior to water-cooled and oil-lubricated models. After many years of research and development, we now offer a Combustor Coil Upgrade Kit to be applied to any Circulatic. The coil is installed as a replacement for bricked or poured refractory combustion chambers. All of the recirculated water, drawn from the drum through the circulation pump, is fed through the combustor coil. It is then fed through the manifold and is divided evenly through the original existing parallel flow coils. Beside the fuel costs savings from the improved efficiency and the reduced emissions, there are several other advantages and reasons to upgrade your unit. Our new drum level sensor and controller provide dependable, low-maintenance control of the water level in a circulatic drum. Our combination of a differential level sensor, a digital level controller and an electrical actuated ball valve or pneumatic feedwater valve (shown here) increases dependability and performance. Unlike the pneumatic and 135-Ohm “slidewire” float controls, the differential pressure level sensors and 4-20mA controllers have no mechanical moving parts to wear out or get stuck in one position. 135-Ohm slidewire devices have always suffered from wear and breakage of the wire wound resistor, causing a loss of signal. Wipers can travel too far off the end of the slidewire, which also causes a loss of signal. Pneumatic controls rely on sliding plungers that often get stuck in one position. They also typically have fragile magnetic head mechanisms that sometimes lose the float plunger and stop controlling. Our combination of the differential pressure level sensor and digital controller rely on 4-20mA- signal technology. This signal technology is considered “tried and true.” Engineers from a wide range of industries accept this as a stable, repeatable and dependable signal technology. Our electric-actuated valves for feedwater control offer tight shutoff. The high torque actuators assure reliable positioning over a long service life. The proven 4-20mA-signal technology is used from the controller to the valve.